Cheese and Caramelized Onion Braid is a recipe we came up with years ago. Since then, we’ve made the caramelized onion bread many times, and it’s never failed to impress our family, friends, and fussy foodies. It’s the type of recipe that you’ll want to serve as a delicious appetizer or alongside a soup or salad. It’s also the type of recipe that you’ll want to keep for yourself because it’s that good. Let me show you how easy it is to make. 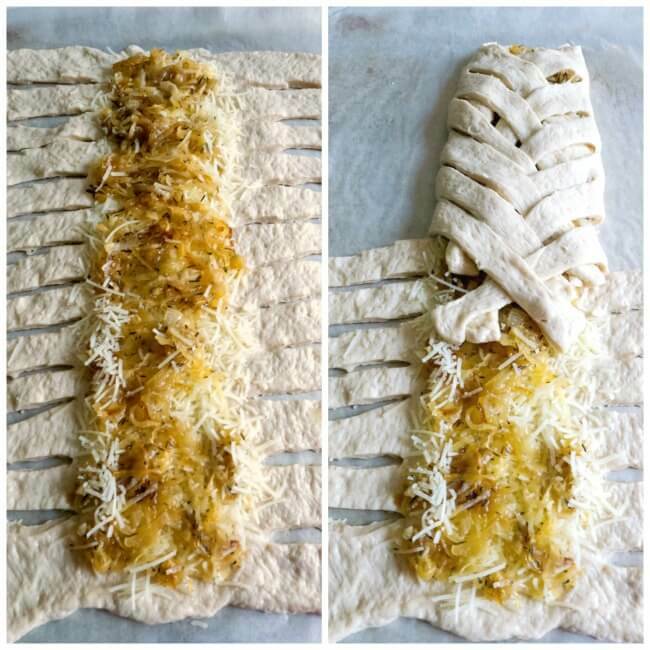 You don’t need a lot of ingredients for the cheese caramelized onion braid. The most work you have is to thinly slice the onions. In a large skillet, you melt some butter, then add the onions. You cook them, stirring occasionally until they’re golden brown. Stir in a little bit of brown sugar and some thyme. That’s it for the caramelized onion. Isn’t that easy? The next important ingredient you need is a refrigerated pizza crust. I know, I know, we usually make our own pizza crust, but believe me, prepared pizza crust works out great. You need to unroll the pizza dough and then place it on a parchment-lined baking sheet. With a rolling pin, press the dough into a 15 x 10-inch rectangle. You sprinkle the cheese down the center third of the dough. Next, you spoon the caramelized onion mixture over the cheese. For the next step, you’ll need scissors or a sharp knife. We like to use scissors, as we did in our Pane Italiano because it seems like we have more control over the cuts. You make cuts 1 inch apart on both long sides of the dough to within 1/2 inch of filling. You now alternately cross the strips diagonally over the filling, turning the ends under and pressing to seal. Brush the top with egg white and then sprinkle with poppy seed. That’s it! Now, you pop the baking tray into a 425 F. heated oven for about 11 to 15 minutes. 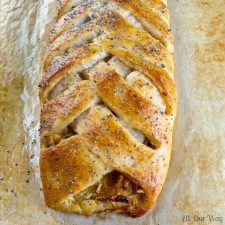 The cheese and caramelized onion braid will turn a beautiful golden brown. Oh, the aroma is divine! The hardest part of this scrumptious bread is waiting for it to cool so you can slice it. Now, be prepared for the compliments, because we assure you they’ll come. Just don’t let on how very easy this recipe is. If you’d like to keep up with our kitchen and grilling adventures be sure to sign up for our newsletter. Savory bread that can be served as an delicious appetizer or alongside a soup or salad. Very easy to make. Heat oven to 425 F. Spray parchment-lined cookie or baking sheet with cooking spray. In 10-inch skillet, melt butter over medium heat. Add onion; cook about 15 minutes, stirring occasionally, until onion is golden brown. Stir in brown sugar and thyme. Cook 1 to 2 minutes, stirring occasionally, until sugar is dissolved. Remove from heat. Unroll pizza dough; place on parchment lined sheet. Starting at center out, with a rolling pin roll dough into 15 x10-inch rectangle.Sprinkle cheese down center third of dough. Spoon onion mixture evenly over cheese. With scissors or sharp knife, make cuts 1 inch apart on both long sides of dough to within 1/2 inch of filling. Alternately cross strips diagonally over filling; turn ends under and press to seal. Brush egg white over top. Sprinkle with poppy seed. Bake 11 to 15 minutes or until crust is golden brown. Let stand 5 minutes before serving. Remove from sheet; cut crosswise into slices. May use other cheese such as Mozzarella or fontina. This braid does look impressive and at the same time it look complicated to make! But your instructions help to cook it for everyone. What a beautiful creation! That gorgeous braided bread is stunning. Thank you so much for sharing this special recipe with us. I’m excited to try this out for a gathering on New Year’s Eve. OMG I need this in my life! It is beautiful and I am in love with all the onions. What an awesome idea! YUMMM! This was much easier to make than I thought it was going to be. It is SO yummy! Made it for my family and we all loved it! Will definitely be making this over and over again. Impressive indeed, what a gorgeous and delicious looking bread. The flavours of sweet onion and cheese are just to die for. Bookmarking it. Thank you, Jagruti! I know you’ll love it. This is beautiful! In flavors and appearance! I saw this and made it today to munch on while my husband and I watched football. AMAZING!! PInned and will be making this again SOON! Impressive indeed! I wouldn’t be able to stop myself from a few slices of this ;D I love caramelized onions…this recipe is definitely getting saved! I love simple fillings like this. 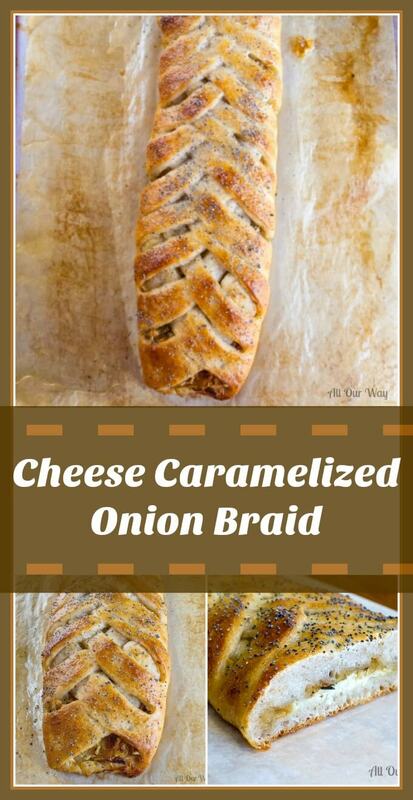 Caramelized onions and cheese – i’m already loving it and the braid looks just perfect! You’ve got some SERIOUS yumminess going on with this recipe! It’s a beautiful braided bread but I want to eat it now! Guess that means I need to go make me a loaf! What a great idea for the upcoming party season! Love stuffed breads, and this one definitely looks like a crowd pleaser! Thank you, Anna! We never have any left whenever we serve it. Super yummy! Not only is it made with a pizza crust, but those caramelized onions are to die for! The guests would surely be impressed with this! Mmmmm I’ve never met a carb that I didn’t like…or a cheese! I can’t wait to try this one out. I love braided bread! I’m also a huge fan of cheese and onions together, I love the smooth textures of the melted cheese with the crunch of onion. Oh, my gosh, Marisa! This cheese and onion braid looks fabulous, delicious and easy! Pinned it and it’s on my to-do list! This is so beautiful! I love making homemade bread, but I’ve yet to brave anything beautiful and fancy like this bad boy right here. I really want to attempt it and you’ve made it look super easy—so I think I’m gonna have to just GO FOR IT. Oh my goodness- this looks amazing! I’m not always big on baked goods- especially if they’re super sweet. I bet caramelized onions and cheese would be PHENOMENAL though! And I would be so intimidated by the braiding, but you make it look easy! I think braided breads are very social. Just sharing some good ole bread amongst friends. 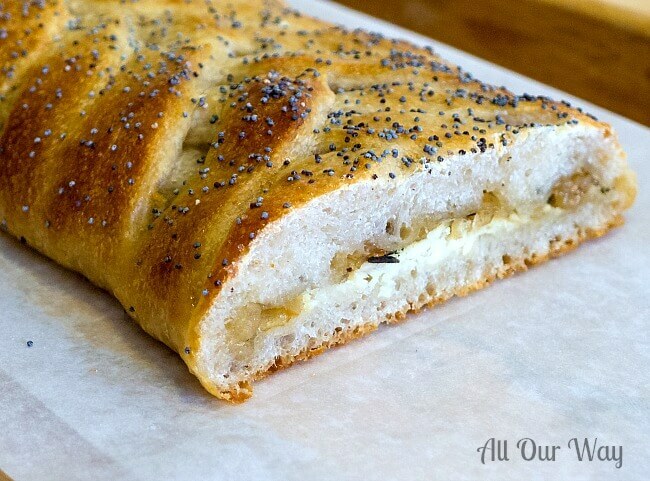 The pre-made pizza dough is genius, your onion bread looks amazing and easy. I’m going to have to save this one. Thank you! This braid is super impressive. I love carmelized onions and always have some on hand in the fridge to put on everything. I love using it in this bread with the asiago cheese. This would be perfect for Mother’s day brunch! Oh wow! You make braiding it look SO easy! I feel like I can totally do this too! It’s absolutely gorgeous – I cannot wait to try it. I’ll shamelessly double the cheese though, think that would affect baking time? Hi, Carmy! It is very good — easy to make too. Extra cheese may take it a little longer to bake. 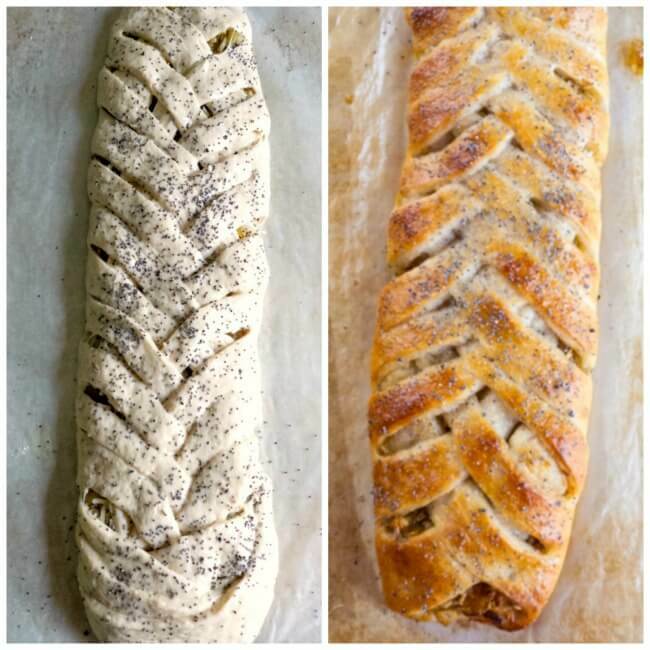 That is one gorgeous bread braid. Definitely a way to impress family and friends. I absolutely love caramelized onions so this recipe is a must make for me! A delicious showstopper for sure! That golden crust is everything! I love how simple it is to make, but this would majorly impress guests. Caramelized onions are a favorite of mine. I can’t wait to give it a try. Hi, Jennifer! It is so impressive. I’ve made it quite a few times and everyone loves it. This is a lovely braid! Caramelized onions are something that I ALWAYS have on hand because we love them so much, but I’ve never seen them in this type of preparation. It’s genius — and I love the layer of cheese you’ve added. I think you’re right, though. I would want this all to myself. Love the pizza dough — it saves me from proofing and kneading. The bread lover in me LOVES this. Caramelized onions are the best…I just made French Onion Soup this past weekend….and they are so good. I would make a meal of this no problem. I have said for years that if I was stranded on an island with wine, cheese and bread I would be good to go. This would be the perfect idea of stranded for me. Hi, Janet! The beauty of the recipe is you can make it savory but you can also add a fruit filling then put a glaze on it. But the caramelized onions are sooooo good!! This looks AMAZING!!!!! I wish I could eat at your house for dinner every night, lol. That is truly a LOVELY braid! I thought about you on Saturday when my husband and I visited an authentic Italian restaurant – such DELICIOUS food. Homemade Foccacia, that tasty red sauce and oh man…. the meatball. That meatball was to DIE for! Your braid today reminded me of all of the delicious smells and tasty food! 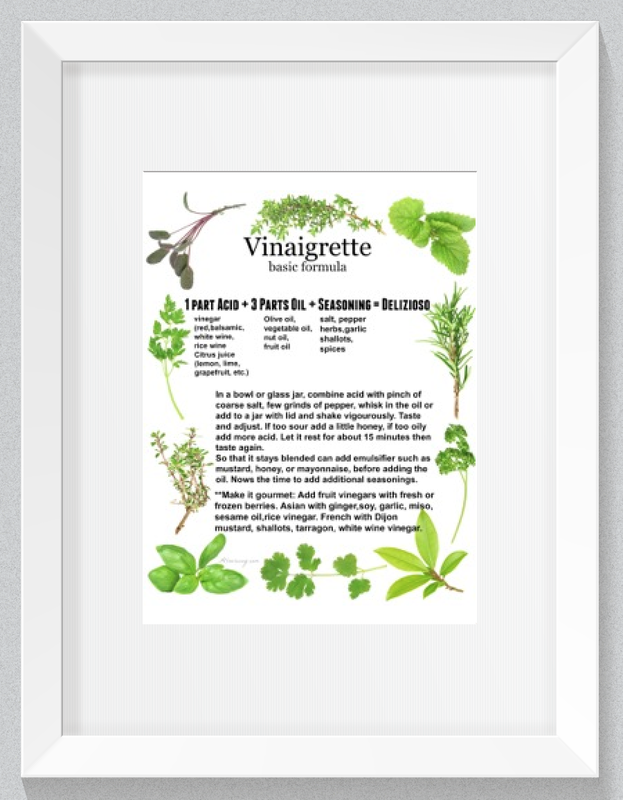 You have such a great recipe here – I believe this will appear on my dinner rotation soon! Thanks! Oh my! I think this would be gone in a flash. I’d eat the whole thing myself. It is a temptation — We hurry and wrap it in plastic wrap, put it in a freezer bag, then into the freezer. Out of sight, out of mind. We’ll get it out when family is around. Holy cow – this bread looks SO good! I seriously need to whip up a loaf of this, but when lots of people are around because I would devour that whole thing. Swoon! I don’t bake during the summer, but this and your herbed swirl bread will be at the top of my “TO TRY” list as soon as the weather turns cold. This seems easy to make, yet when finished gives off the impression of a bread that you worked on for hours! Thanks for another great post, Marisa! Love your bread recipes Marisa. I definitely have to add this to my list to make soon. You will love the recipe,Jovina! You can easily make several braids at a time and believe me when I say it goes fast.